So when news releases leading up to next week’s Mobile World Congress — several of them mentioning 5G in rosy terms, “catalyst for a better future” typical among these — started flooding my inbox this morning, it seemed an opportune time to investigate. Pardon my top-slice view; I’m not well-versed enough in the technology to discourse knowledgeably, but here’s quick round-up of salient points related to positioning in the fast-oncoming Next Step in cellular communications. 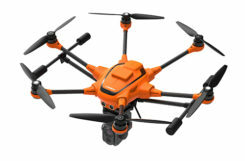 Regular contributing editor for Professional OEM and UAV Tony Murfin will return to this space next month, with a column previewing the massive AUVSI Xponential show in Denver, April 30–May 3. He’ll be there, too, covering the event! The cellular 5G standard has been designed to target latencies under one millisecond, data rates of up to ten gigabits per second, extremely high network reliability, and better accuracy in positioning. With location awareness becoming an essential feature of many new markets, positioning is consequently considered as an integral part of the system design of upcoming 5G mobile networks. Its feet firmly planted in both the present and the future, the cellular industry is currently in the midst of implementation of Long Term Evolution (LTE)-Advanced, an evolution of what might be called plain old LTE, and a “true 4G” mobile broadband. Simultaneously, the industry is preparing the next step, as “there is a vastly increased need for a new mobile communications system with even further enhanced capabilities, namely a fifth generation (5G) system.” 5G will process communication 10 times faster than 4G, according to experts. That’s enough to download a 3D movie in 30 seconds. It would take six minutes on 4G. Alert techie viewers of the present ongoing Olympics in South Korea may have noted 5G in action there, in demos of such things as live-streaming virtual reality of bobsled and luge runs, putting the viewer in the breathtaking driver’s seat, and a test drive earlier this month from Seoul to Pyeongchang, a journey of several hours, without any human intervention whatsoever at the car’s controls. The demonstrations in Pyeongchang are laying down a backbone for what will be on show at the Tokyo Games in 2020, when 5G roll-out will be complete in many major metro areas. As trumpets sound the fanfare for next week’s Mobile World Congress in Barcelona, AT&T announced it will first roll out 5G to three locations: Dallas, Texas; Waco, Texas; and Atlanta, Georgia. The plans introduce the service to about a dozen U.S. markets by late this year. Qualcomm meanwhile is offering insight into its 5G chips. What has all this got to do with GNSS? Well, aside from the aforementioned precise positioning via cellular to be afforded by 5G, the two technologies share one prominent technique: adaptive array antennas for digital beam-forming. Here I am indebted to Gary McGraw of Rockwell Collins for a primer on the subject, which he presented at the International Technical Symposium on Navigation and Timing (ITSNT) in November 2016. Adaptive array technologies have many advantages for PNT: primarily, in mitigation for multipath and for jamming and spoofing mitigation. Adaptive antenna arrays with digital beam-forming (DBF) are becoming increasingly important for PNT in challenging signal environments. DBF combines multiple antenna inputs to generate gain in arrival direction of the desired satellite signal and to create spatial nulls in direction of jamming. Emerging applications of DBF in 5G involve dense networks of picocells, small cellular base stations typically covering a small indoor area. Picocells extend coverage where outdoor signals do not reach well, and add network capacity in areas with very dense phone usage. In this context, 5G cellular architectures will use adaptive array technology to achieve high data rates, spectrum reuse and communications robustness. The implications for PNT are that 5G system architectures will require improved (relative) PNT to operate effectively, and these 5G picocells will be a source of PNT information in constrained environments. 5G involves massive directional communications via multiple-input multiple-output (MIMO), enabling high-bandwidth communications in fading (multipath) channels by using multiple antenna inputs to adapt to channel. It can do this without knowledge of user location, but it adds to the processing complexity. The directional capability can enable multiple users to be serviced in a picocell at different frequencies, while permitting spectrum re-use by nearby picocells through narrow beam-width and the limited range of millimeter-wave frequencies. The PNT implications of 5G architectures, according to Gary McGraw of Rockwell, are, principally, that efficient operation of directional links will require some level of knowledge of user location with regard to picocells. Picocells will need to have the ability to do direction-of-arrival positioning and ranging in order to maintain connectivity with user nodes. This can be exploited by the user node for positioning and location-based services, particularly for indoor and dense urban environments. Meanwhile, the proliferation of adaptive array technology will drive down costs for other applications. Further, millimeter-wave transmit/receive modules will become commodity items, analogous to what cell phones have done for GPS chips. 5G picocells will be synergistic with PNT in challenged environments — naturally, indoor and dense urban. They will necessitate development of distributed, networked PNT processing and infrastructure. Availability of adaptive array technology will increase with deployment of 5G, and costs can be expected to drop dramatically. 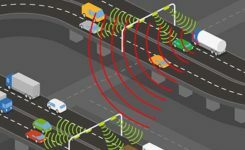 In addition to GNSS, adaptive array technologies can be employed to support short-range, relative PNT applications such as vehicle-to-vehicle communications and relative positioning. 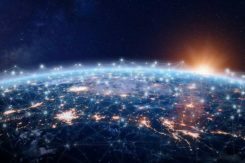 The key driver for all this is that customers, the global We, expect the same quality of experience from Internet applications anytime, anywhere, and through any means of connectivity. The rapid proliferation of smartphones and other mobile devices that support a wide range of applications and services mean that image transfer and video-streaming, as well as more cloud-based services, such as cloud speech services, have become the new norm. Their requirement for massively more data than, say, simple texting is conveniently hidden from or forgotten by users. We want it. We want it now. 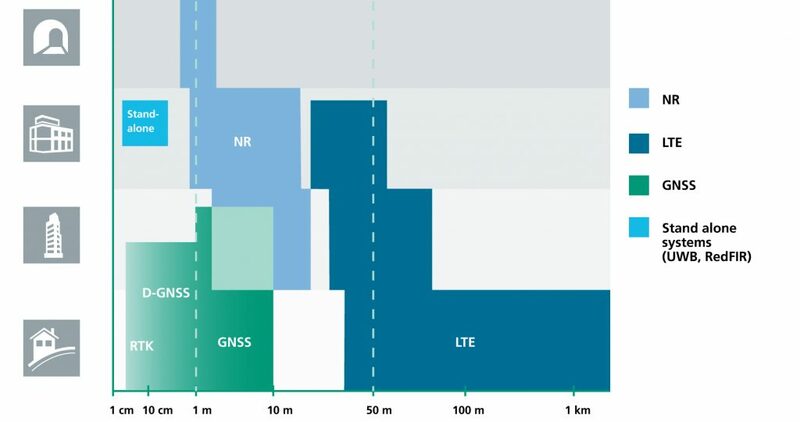 From a DOCOMO 5G White Paper: 5G Radio Access: Requirements, Concept and Technologies. NTT DOCOMO, INC., July 2014. At https://www.nttdocomo.co.jp/english/binary/pdf/corporate/technology/whitepaper_5g/DOCOMO_5G_White_Paper.pdf. Tomorrow, or perhaps the next day, everything will be connected by wireless to enable monitoring and collection of information and control of devices. Thus, remote monitoring and real-time control of nearly all electronic devices in machine-to-machine (M2M) services and Internet of things (IoT): connected cars, connected homes, moving robots and sensors. Such services will become more extensive and enriched through richer content delivered in real-time. Get set for the tactile Internet, augmented reality, and other brave new wonders. The 5G positioning framework will thereby integrate a multitude of sensors based on both, cellular signals and 3GPP independent techniques, into a hybrid positioning scheme, according to the Fraunhofer Institute for Integrated Circuits (IIS) in Germany. Fraunhofer IIS is currently prototyping low-latency and high-precision positioning systems for legacy LTE and future 5G New Radio (NR). Two selected industrial IoT live demonstrations can be seen at next week’s Mobile World Congress 2018. 5G NR enables positioning performance by providing high bandwidths for precise timing, new frequency bands at mm-wave, massive MIMO for accurate angle-of-arrival estimation and new architectural options that support positioning. 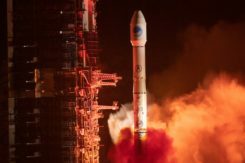 Improved levels of accuracy, robustness and latency, not possible today, can soon be achieved, according to Institute. 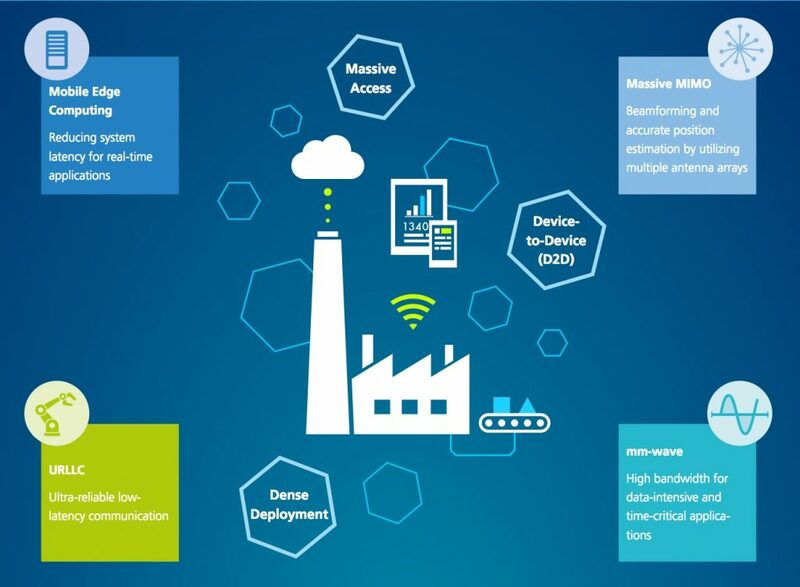 5G provides fast and reliable access to moving objects, to achieve time-critical process control and optimization in industrial environments not possible with today’s cellular technology. As requirements vary according to the specific use cases, 5G NR will provide a flexible air interface allowing for scalable bandwidths, data rates, latencies, and positioning accuracy levels. With location awareness becoming an essential feature of many new markets, positioning is an integral part of the system design of 5G mobile networks. Increased contextual awareness of goods, parts, machines and workers will enable new interaction and collaboration. Fraunhofer IIS is working on novel approaches for sub-meter accuracy to enable tracking of mobile devices in indoor and urban areas where GNSS is not sufficiently accurate nor available. Its 5G positioning framework integrate several sensors. The key benefits of 5G in this regard are high accuracy, reliability, mobility and coverage; low latency and low power; and scalability. The Institute offers the facilities of its Test and Application Center L.I.N.K. in Nuremberg, Germany. The test center includes a 3D positioning system capable, according to the organization, of reproducing, simulating and emulating all kinds of possible environments, using every common communication and positioning system commercially available.